Following Istanbul Nightclub Attack, Secular Turks Fear More Attacks In Their Neighborhoods : Parallels After the New Year's attack on a nightclub in Istanbul that left 39 dead, secular Turks feel like years of pressure are now outright danger. Some are leaving areas that could be targets for attack. 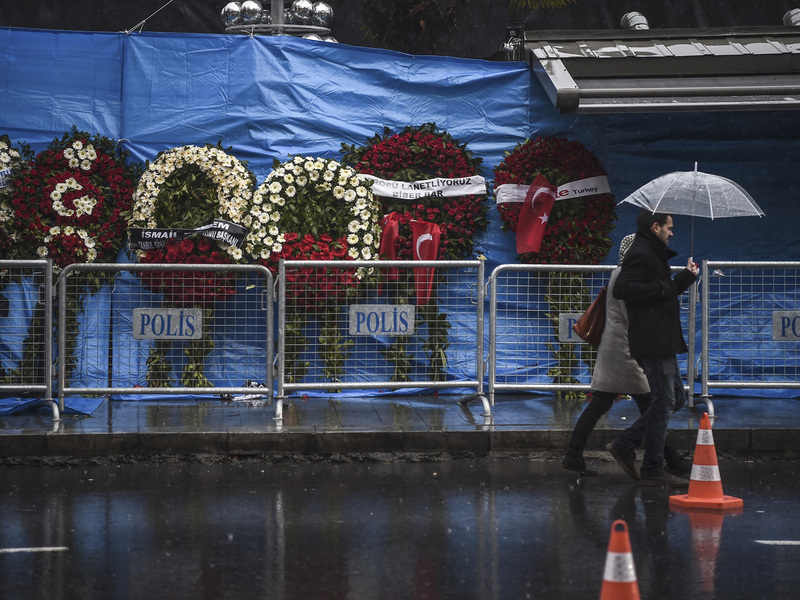 A couple walk past the Reina nightclub in Istanbul, days after a gunman killed 39 people on New Year's night. By way of contrast, some Turks point to what happened in November 2015, when gunmen stormed Paris cafes and entertainment venues, killing more than 100 people. Parisians quickly rallied, saying the only response was to keep right on going out at night, which many did. In Istanbul, there was a similar call right after the New Year's nightclub attack, but the response so far has been different. A well known Turkish writer and actor, Gulse Birsel, wrote a newspaper column urging people not to get lost in despair. "Go out every night," she wrote, "to a movie, a play, hang out at a music concert." The column has drawn praise. But in Istanbul's more secular neighborhoods the response feels more like fear than defiance. "Beer Time" is a bar that occupies a corner just off the city's major commercial thoroughfare, Istiklal Street. Songs from the pop charts of yesteryear are playing as bartender Selami, who like many Turks these days is cautious around reporters and gives only his first name, sits down to chat. He only has a couple tables to watch. He says in the past several years business has gone from bad to worse. "There were the Gezi Park protests in 2013," he says, referring to anti-government demonstrations in nearby Taksim Square that were violently crushed by riot police. Then there was a bomb that hit tourists on Istiklal Street — after that, he says the place was almost empty. "This New Year's Eve we were actually packed," he says. "But then people started getting alerts on their phones about the nightclub attack, and in no time pretty much the whole street was deserted." Selami jumps up as a quartet of students gets ready to leave. These days, he says, it's mainly students who come here. His old regulars are nowhere to be seen, and the customers that do show up are jittery. "I think it was yesterday, a woman came in and ordered a beer," he says. "She saw two foreign guys at another table and called me over. She pointed at one and said, 'Doesn't he look like the nightclub attacker?' People are starting to feel super-paranoid." President Recep Tayyip Erdogan has been trying to pull a divided country together, and says he won't allow terrorists to harm anyone's lifestyle, religious or secular. He told an audience of local leaders that he rose to power arguing for tolerance for pious Muslims in officially secular Turkey, and that same tolerance should extend to those with secular values. "Just as it is wrong for people who cannot tolerate the call to prayer to trample on a preacher, it is wrong to use force against those who do not pray," he said to warm applause. "In Turkey, nobody's life style is under systematic threat." Secular Turks aren't so sure about that. They've been feeling increasing pressure for years under Erdogan's government, led by a party with roots in political Islam. Turkey's head of religious affairs was one of the first to condemn the nightclub attack. Critics say that may be in part because the day before New Year's Eve, he issued a sermon to be read in all mosques. It criticized year-end celebrations as not consistent with Muslim values. In the largely secular Cihangir neighborhood, home to Turks, foreign journalists and diplomats, a young man who gives his name as Aram take a break outside a café-bar called Mellow. It looks like a cheerful shoebox of a place, but these days Aram says the mood is somber. Many of his Turkish customers are staying away, and too many of the expats who round out the cosmopolitan atmosphere here are dropping in to say goodbye. "I remember one Italian guy who used to come here a lot," he says. "He's lived here for 10 years, but he said he has to go home because he doesn't feel safe here." Another trend he's noticed is people moving out of the neighborhood altogether. Non-religious Turks say secular values may be fiercely defended in Paris, but in today's Turkey they're merely tolerated, and then only sometimes. They're hoping the president's call for tolerance is more than just reassuring rhetoric.